*full disclosure: an online screener of this film was provided by Lou Simon. **a few minor spoilers here. Cast: Norbert Velez, Todd Bruno, Aniela McGuinness, Giordan Diaz, Tom Stedham, Gema Calero, Reggie Peters and Daniela Larez. Hazmat is the second horror film from director and writer Lou Simon. Her latest, which is set to premiere at the Massachusetts Independent Film Festival August 16th, follows some of the formulas of a slasher film. A character is set up in a prank and the results are a little bloodier than expected. Simon develops the characters in the film before the action takes place. But, some of the scenes come across as awkward. The blood and gore is prolific as Simon hones her skills in the horror genre. The film's story is a simple set-up. A film crew, who work on the show "Scare Antics," are set to prank, Jacob (Norbert Velez), an obviously mentally disturbed young man. 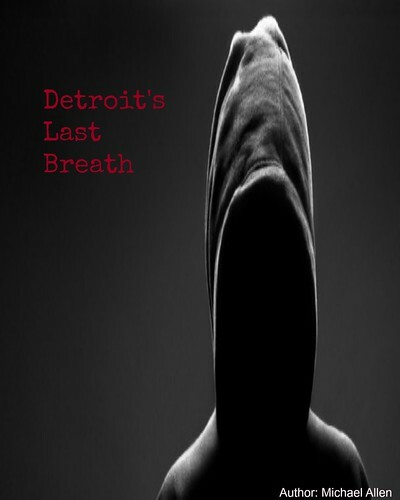 Their work of installing hidden cameras begins in the warehouse where Jacob's father died. Jacob is forced to revisit this warehouse, with encouragement from several pseudo-friends. Jacob figures out, quickly, that he has been pranked and he takes his humiliation out on the crew of the show and on anyone else in axe swinging distance. Much of Simon's first act focuses on the film's characterizations. Each character, or soon-to-be victim is given some dialogue and a dimension as the film crew sets up their latest show, in the darkly lit warehouse. Even the antagonist gets time onscreen, to show his strange beliefs. Unfortunately, Jacob's character gets very little attention in further acts and no more dialogue. So, the focus is on the victims, who are only an axe swing or two away from death. Though, Simon treats most of her characters with respect. There are a few awkward scenes early in the film. Jacob's approach to the place where his father died is very strange. The character or actor behaves as if they are enterering an amusement park, or similar. The emotions used in this early scene are completely inappropriate, when compared to the arc of the story. The mood would more likely be sombre, rather than joyful, in reality. As well, the love story and romance between the show's producer David (Todd Bruno) and make-up artist Brenda (Aniela McGuinness) is also awkward at times. There are some believable scenes between these characters. However, they also seem to fawn over each other a little too much. It seems strange to see two characters so affectionate, when a killer is only a few feet away. More awkwardness is brought about through some of the performances from the actors. Lines are not consistently delivered with assurance, nor naturalness. The awkward scenes seem to fade away as the film's action increases, though. 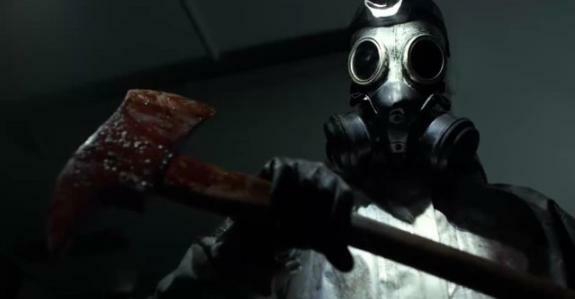 And, Hazmat develops much like a slasher, or hack and slash horror film. There is a killer, there is a mask, there is a tool of pain and there are several gory scenes. Some of the gorier scenes are delivered tongue-in-cheek. A decapitated head bounces through one scene, which was a little surprising. Also, characters are constantly on the threshold of escape, but the killer seems to have a long reach. Most characters do not see the light of day, again. These bloodier scenes are developed with some effective make-up and there is plenty of horror onscreen, for fans to enjoy. 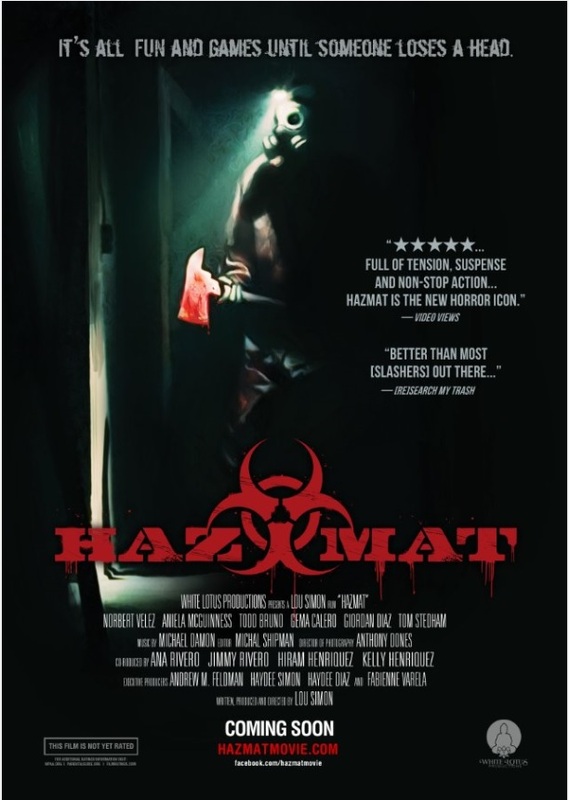 Hazmat will make the film circuit rounds and horror fans are encouraged to seek this film out. There are a few flaws here; however, Simon has chosen to focus on her characters, which is a good decision. Overall, events onscreen are never boring, nor slowly paced. Hazmat is an exciting film spent with a few interesting characters and a few grisly sights. Overall: 6.75 out of 10 (the acting is only okay, characters make the same mistakes over and over again, no surprises in the conclusion, the killer shuts down through Acts II and III).